Telugu language literature is 3500 years old.Though ambiguity exists in this regard, it might be even older than or even contemporary to the professed South Indian ancient languages.Nonavailability of ancient literature despite the language being quite old is attributed to the little support that the language received from the pre-1000 AD rulers. During the period of patronage of Eastern Chalukya rulers in 1000 AD, the language attained its present script, rich vocabulary and grammar rules. 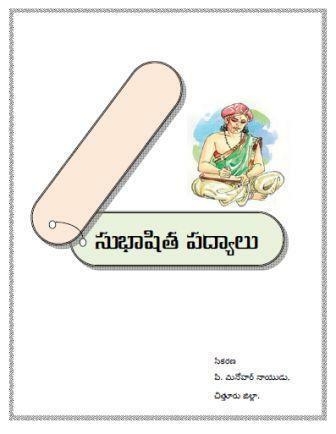 This standardization led to development in the quantity and quality of literature of Telugu Language, which was predominantly composed of poetry. This phase of development reached its zenith under the rule of Sri Krishna Deva Raya of Vijayanagara Empire. Modern Telugu poetry has seen English transliterations.But modern poetry has also had its ups and downs. The so-called naked poets and revolutionary poets wrote what could hardly be called poetry. They created a repulsive atmosphere and their writings have had their most deserved end — few bother about them today. The ancient poets were no fools. They worshipped beauty and tried to create an atmosphere of happiness, and a graphic picture of what they wrote. Vemana was a telugu poet. He composed numerous poems in Telugu in Aata Veladhi metre which consists of four lines. They end with the signature line Viswadhaabhi Raama, Vinura Vema, literally Beloved of Vishwadha, listen Vema. Vemana's poems were collected and published by C.P.Brown in the 19th century.His poems are of many kinds, social, moral, satirical and mystic nature. All of them are in Ataveladi. his poems deal with social problems and sometimespropose solutions too. This is a good wisdom poems. It is very famouse in Telugu. He has written 100 poems. So it is called Vemana satakam. each poem is a lesson of life.